DieHard Cricket Fans: DICHOTOMY OF THE ADARSH CRICKET FANS ! DICHOTOMY OF THE ADARSH CRICKET FANS ! Indian Cricket Fan-base is perhaps the single largest sporting entity in the world that outnumbers the total fan-base of all the opposing teams put together. Yes, including the associate teams. Today, the BCCI and the Indian Fans are called arrogant by the Aussies and even Bangladesh. The Aussies conveniently forget that they, along with England held the veto powers and made rules for well over a century. It lasted till Jagmohan Dalmia shifted the base of Cricket for good and changed the way Cricket as a spectator sport was sold. From an Indian perspective, I see India sitting in the position Uncle Sam sits in the world politics. Everyone needs India but everyone hates India; for the same reason: Money ! Now let us turn to Bangladesh. It is a country as big as West Bengal and has a team that can be beaten by the Karnataka Ranji team most of the times. They have won just 3 matches against India in all these years. And one wrong decision and there is a huge outcry and Anti-BCCI and Anti-India noise in our neighborhood with even their Prime Minister going berserk. Sensible Cricket followers will remember, the Umpiring decisions hurt both ways. Imrul Kayees got a favorable decision too. But he didn't make it count like Rohit did. And what are they talking about ? The argument is as if had Rohit got out at that stage, India would have been bowled out for 230 ? Raina was still playing and Dhoni and Jadeja too were there to follow. There was a probability of Raina unleashing another 100 and India might have ended up with 320 or 330. And the victory margin was not 9 runs but 109 ! Everyone supports their team and calls other team fans arrogant and all kind of names. But there is almost a palpable jealousy when it comes to Indian Cricket Team​. Everyone loves to hate Team India because of BCCI, the money and their batsmen. With this background, India has a huge secular fundamentalist #AdarshCricketFan base. I understand Indians supporting Argentina or Brazil in soccer or Roger Federer or Rafa Nadal in tennis. We simply don't have a player of world standard. But In Cricket, we have a world class team with no doubts whatsoever. This team has won more accolades than any other team of the past. Except for Australia of the first decade of this millennium, no team has won as many titles as this Indian team. But what do our Indian fans do ? They actually want India to lose to Australia and many of them wanted Australia Vs South Africa final. Now that South Africa are out, they want a New Zealand Vs Australia final. It is true, I too am often exasperated by the inconsistent bowling and have criticized the team. Anyone will face criticism when the team is losing. But India's Adarsh Cricket Fans are the ONLY people in the world who criticize their team when it is winning and winning handsomely. I saw a lot of WhatsApp​ and Facebook posts lamenting for South Africa after their exit last night. Now, let us see the track records. Let us keep out Test Cricket and Overseas records out of this. 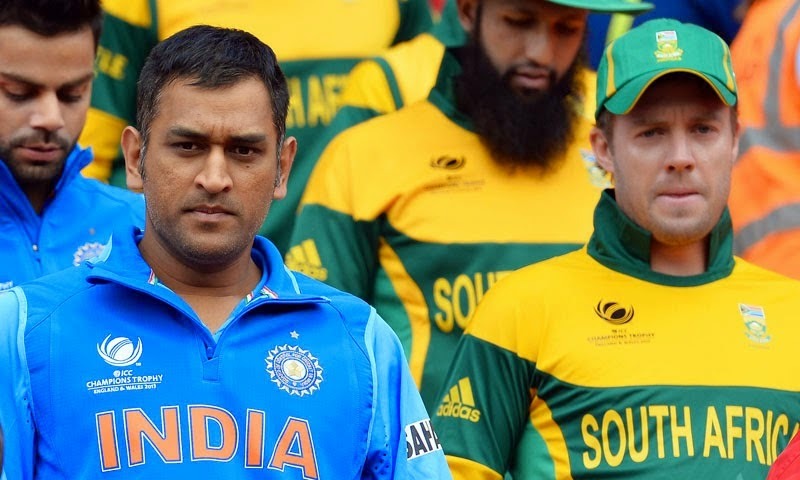 Let us concede South Africa have a great talented team and even I expected them to win this world cup. But once this edition of CWC has started, we have seen a transformed Team India. Going back in time, what India have achieved in ICC tournaments since 1992 ? I understand criticism when the team loses. But here, a team has played like a team and dominated like never before. And we are still running them down as lucky and mediocre team. Sir. Jadeja's place is perennially in question. What are his records ? 133 wickets from 107 matches with average below 3.2 and economy rate below 4.8 RPO. He also has 10 scores of 50+ and a healthy strike rate as a batsman. But we still want him to be dropped. Now what are South Africa's records in big tournaments ? How many times have we seen and heard about attacks and stone pelting on the houses of our Cricket players ? Yuvraj Singh battled cancer on his way to leading India to 2011 CWC title. Within 3 years, people forgot and there was stone pelting at his place after the 2014 T20 WC finals loss. What did South Africa do yesterday ? They missed 2 sitting duck run out chances, one of them was by their own Captain. 2 catches that should have been taken with closed eyes were dropped. Pressure does strange things to people and great athletes are no exception. South Africa choked ! What were the reactions of our Netizens ? * Felt sad for ABDV, what a fantastic Champion and he's lost. How cute, we didn't think of Yuvi when we said this ! * What a great bowler Steyn is [he is, no doubt]. My heart goes out to him. So sad, we didn't give a damn thought for Zaheer Khan and Ashish Nehra after the 2003 CWC final. What did the so great self-hyped South Africa do in this CWC before the semifinals that made them so formidable ? Lost to India by 130 runs. That was a damn fluke, right ? Lost to Pakistan. Hmmm, that was one off day. Their batsmen made merry against all teams that didn't bowl and field well. Then beat Sri Lanka comprehensively. THIS was their ONLY SINGLE significant win in this edition of World Cup. And what has India done in this World Cup ? Won 7 out of 7 matches, bowling out every opponent. 7 TIMES LUCKY AND 7 TIMES FLUKE RIGHT ? And now, if they go on to lose to Australia or New Zealand, we will not shed tears for Kohli or Dhoni or Shami. But what will we do ? We will pelt stones at Raina's house or Mohit's house or we will abuse Jadeja. That is us, the secular, liberal, Adarsh Cricket Fans ! Five Alternative Professions for Dhoni !